COMPLETE Home Security System - $27.99 BASIC SYSTEM: $99 Parts and Install. 36-Month Monitoring Agreement required at $27.99 per month ($1,007.64). 24-Month Monitoring Agreement required at $27.99 per month ($671.76) for California. Offer applies to homeowners only. Basic system requires landline phone. Offer valid for new ADT Authorized Premier Provider customers only and not on purchases from ADT LLC. Cannot be combined with any other offer. The $27.99 Offer does not include Quality Service Plan (QSP), ADT’s Extended Limited Warranty. FREE Home Security System - $27.99 BASIC SYSTEM: $99 Installation. 36-Month Monitoring Agreement required at $27.99 per month ($1,007.64). 24-Month Monitoring Agreement required at $27.99 per month ($671.76) for California. Offer applies to homeowners only. Basic system requires landline phone. Offer valid for new ADT Authorized Premier Provider customers only and not on purchases from ADT LLC. Cannot be combined with any other offer. The $27.99 Offer does not include Quality Service Plan (QSP), ADT’s Extended Limited Warranty. OOS $19.95 PROMOTION: Customer will be charged $36.99/month and will receive a one-time 12 month promotional credit of $204.48 issued to the original form of payment on file within 30 days post installation and active monitoring service. This offer is valid only on the base monitoring package (ADT Pulse not included). COMPLETE Home Security System - $36.99 BASIC SYSTEM: $99 Parts and Install. 36-Month Monitoring Agreement required at $36.99 per month ($1,331.64), 24-Month Monitoring Agreement required at $36.99 ($887.76) for California, including Quality Service Plan (QSP). Offer applies to homeowners only. Basic system requires landline phone. Offer valid for new ADT Authorized Premier Provider customers only and not on purchases from ADT LLC. Cannot be combined with any other offer. FREE Home Security System - $36.99 BASIC SYSTEM: $99 Installation. 36-Month Monitoring Agreement required at $36.99 per month ($1,331.64), 24-Month Monitoring Agreement required at $36.99 ($887.76) for California, including Quality Service Plan (QSP). Offer applies to homeowners only. Basic system requires landline phone. Offer valid for new ADT Authorized Premier Provider customers only and not on purchases from ADT LLC. Cannot be combined with any other offer. COMPLETE Home Security System - $27.99 BASIC SYSTEM: $99 Parts and Install. 36-Month Monitoring Agreement required at $27.99 per month ($1,007.64). 24-Month Monitoring Agreement required at $27.99 per month ($671.76) for California. Offer applies to homeowners only. Basic system requires landline phone. 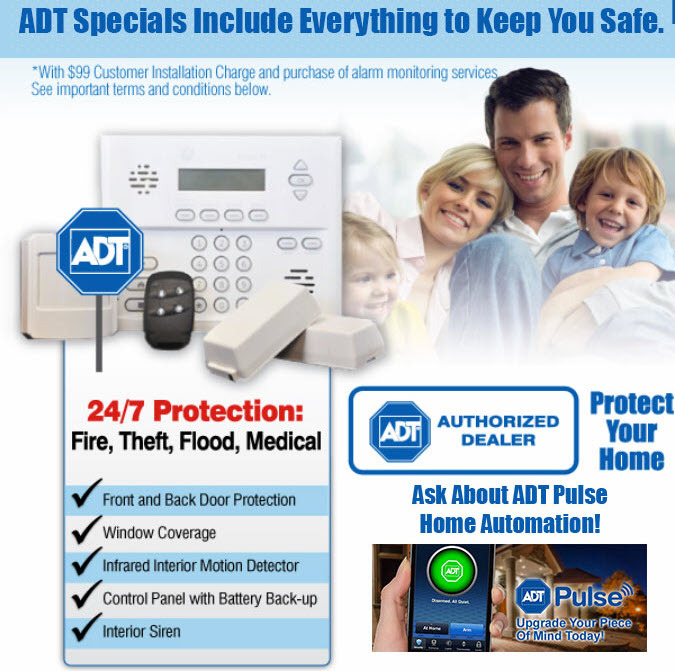 Offer valid for new ADT Authorized Premier Provider customers only and not on purchases from ADT LLC. Cannot be combined with any other offer. The $27.99 Offer does not include Quality Service Plan (QSP), ADT’s Extended Limited Warranty. FREE Home Security System - $27.99 BASIC SYSTEM: $99 Installation. 36-Month Monitoring Agreement required at $27.99 per month ($1,007.64). 24-Month Monitoring Agreement required at $27.99 per month ($671.76) for California. Offer applies to homeowners only. Basic system requires landline phone. Offer valid for new ADT Authorized Premier Provider customers only and not on purchases from ADT LLC. Cannot be combined with any other offer. The $27.99 Offer does not include Quality Service Plan (QSP), ADT’s Extended Limited Warranty. Licenses: AL-19-001104, AR-CMPY.0001725 AZ-ROC217517, CA-ACO6320, CT-ELC.0193944-L5, DC-EMS902653, DC-602516000016, DE-07-212, FL-EC13003427, EC13003401, GA-LVA205395, IA-AS-0206, ID-ELE-SJ-39131, IL-127.001042, IN-City of Indianapolis: LAC-000156, KY-City of Louisville: 483, LA-F1914, LA-F1915, LA-F1082, MA-1355C, MD-107-1626, ME-LM50017382, MI-3601205773, MN-TS01807, MO-City of St. Louis: CC#354, St. Louis County: 95091, MS-15007958, MT-PSP-ELS-LIC-247, NC-25310-SP-FA/LV, NC-1622-CSA, NE-14451, NJ Burglar Alarm Lic. # -NJ-34BF00021800, NM-353366, NV-0068518, City of Las Vegas: 3000008296, NY-Licensed by the N.Y.S. Department of State UID#12000317691, NYS #12000286451, OH-53891446, City of Cincinnati: AC86, OK-AC1048, OR-170997, Pennsylvania Home Improvement Contractor Registration Number: PA022999, RI-3582, RI-7508, SC-BAC5630, SD- 1025-7001-ET, TN-1520, TX-B13734, ACR-3492, UT-6422596-6501, VA-115120, VT-ES-2382(7C), WA-602588694/ECPROTEYH934RS, WI-City of Milwaukee: PAS-0002790, WV-WV042433, WY-LV-G-21499 Licenses: AL-17-1104, AZ-ROC217517, AR-2008-0014, CA-ACO6320, CT-ELC.0193944-L5, FL-EC13003427, DC-EMS902653, GA-LVA205395, ID-ELE-SC-39312, IL-127.001042, KY-City of Louisville: 483, LA-F1082, LA-F1914, LA-F1915, 225-960-6301, ME-LM50017382, MD-107-1626, MA-1355C, MI-3601205773, MN-TS01807, MS-15007958, MT-247, NV-68518, NJ-Burglar Alarm Business Lic. #34BF00021800, NM-353366, NY-Licensed by the N.Y.S. Dept. of State UID#12000317691, #12000286451, NC-1622-CSA, OH-53891446, OK-1048, OR-170997, Pennsylvania Home Improvement Contractor Registration Number: PA022999, RI-3582, TN-1520, TX-B13734, ACR-3492, UT-6422596-6501, VT-ES-2382, VA-115120, WA-602588694/PROTEYH934RS, WV-042433 Address 3750 Priority Way South Dr. Indianapolis, IN 46240 ©2019 DEFENDERS, Inc. dba Protect Your Home General GENERAL: For all offers, the form of payment must be by credit card or electronic charge to your checking or savings account, satisfactory credit history is required and termination fee applies. Certain packages require approved landline phone. Local permit fees may be required. Certain restrictions may apply. Additional monitoring fees required for some services. For example, Burglary, Fire, Carbon Monoxide and Emergency Alert monitoring requires purchase and/or activation of an ADT security system with monitored Burglary, Fire, Carbon Monoxide and Emergency Alert devices and are an additional charge. Additional equipment may be purchased for an additional charge. Additional charges may apply in areas that require guard response service for municipal alarm verification. Prices subject to change. Prices may vary by market. Some insurance companies offer discounts on Homeowner’s Insurance. Please consult your insurance company. Photos are for illustrative purposes only and may not reflect the exact product/service actually provided.